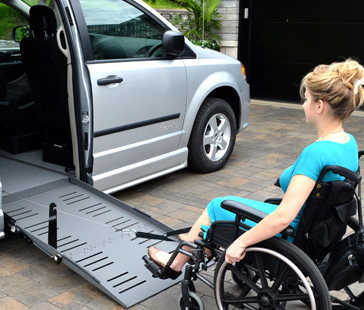 The power-pull ramp assist is designed to easily move you and your wheelchair up a wheelchair ramp and onto the floor of a lowered minivan. With the push of a button, your wheelchair will be safely pulled up the ramp or lowered down the ramp to exit. The power-pull ramp assist lets you transition up the ramp smoothly from the ground level. Its wireless remote feature allows for convenience and comfort when traveling. Two wireless remotes come standard with the system. The power-pull ramp assist was created for side or rear entry lowered floor minivans, and it stows easily within the vehicle. Depending on the type of van, the system can be installed under the third-row seating or between the front seats for storage that will not interfere with maneuverability within the minivan. The power unit itself is six inches by nine inches by 12 inches. The power pull ramp assist comes equipped with multiple features to keep you safe and secure during use. The unique clutch system was specially created to maintain tension whenever the wheelchair is engaged. The cable retracts and locks to prevent tangling or unraveling. If the wheelchair is not ascending the ramp straight, there is a breaker system that activates to prevent the chair from being pulled over the ramp edges. The power pull ramp assist has a maximum capacity of to 350 pounds and uses 15 feet of resilient cable. For exiting a vehicle, the power pull ramp assist can make your descent smooth and careful. The cable stays taut to keep you from rolling backward. For additional safety, the release button only works when the system is not in use. For further assistance with mobility equipment, please visit Goldline Mobility. We want to help you find the right equipment for your transportation needs.